It isn’t just bitcoin that has lost significant value. Ethereum (down 20 percent), Bitcoin Cash (down 30 percent), Litecoin (down 21 percent) and nearly every high-profile altcoin lost value over the last 24 hours, according to Coinmarketcap.com. Ripple was up seven percent, and just one of two coins to remain green over the past day. 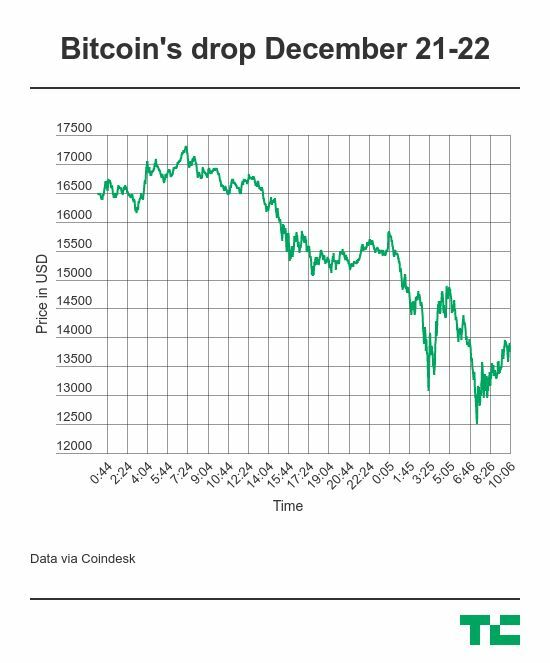 What’s causing the depreciation is anyone’s guess in the same way that nobody knows exactly why bitcoin’s price has slot up from a touch under $1,000 at the start of the year — although many do attribute that to financial institutions embracing the cryptocurrency.